Health & Beauty=Toxic Nightmare? What’s Hiding in Your Bathroom? Have you ever looked on the back of your beauty product labels? Can you pronounce half of them, or do you know what half of them actually are? I will tell you from my own research that there are one too many harmful ingredients in most of them, unless it is manufactured by an organically minded company. I wanted to write this article in association with my other article on how to DIY your own Toothpaste, Mouthwash, Shampoo, Conditioner, Face Wash, Face Mask, and Deodorant, which you can find HERE(will post shortly). I did not list all of the ingredients in the above listed products, but simply a few examples to show the dangers that we put on and in our bodies every day. I also listed the sites that I retrieved the information from after each one! Of course, I encourage everyone to do their own research, because at the end of the day, only you are the one really looking out for you or your family. Benzalkonium Chloride: (aka alkyldimethylbenzylammonium) Used as a disinfectant in mouthwash and microbial corrosion inhibition in oilfields, as well as many other industrial uses. Sodium Lauryl Sulfate: Found in 90% of shampoo and conditoners and has been blamed for premature hair loss. Found in Car wash soaps, engine degreaser, toothpaste, lotions, and garage floor cleaners. Propylene Glycol: Derived from petroleum products, used in antifreeze, de-icers, paint, and laundry detergent. This one can also cause nausea, vomiting, and diarrhea if ingested. Of course, we are not eating this stuff…but we are putting it right on top of our brains. What the What?! Aluminum: The main and sometimes the only active ingredient in deoderant. It is also used in other beauty products as well. It has been linked to breast cancer and alzheimers disease. There are many other ingredients not even listed here, but honestly, that should be enough proof for any person! If you can’t pronounce the ingredient, it probably isn’t good for you. Just a good rule of thumb to think about with any ingredient you ingest or put on your body, food included. So, how to fix this? You DIY IT! And it is super easy! Vote with your dollar and live self reliantly. The fate of you and your family’s health depend on it. Most Americans have ingested and absorbed numerous toxins since being in the womb…I can at least say that about my generation, when everything was made “cheaper and better” with no prolonged scientific studies of what the long term effects would be on humans. We just recently made this switch to our own DIY products to hopefully decrease the number of toxins entering our bodies. The important thing to remember is that every day is a new day. The sooner you start, your chances of decreasing the amount of toxins and bad junk are astronomically higher!! You can always buy from more natural ingredient focused companies, but that can get expensive. Why not try DIY easy recipes that can be whipped up in no time! If your hair is long enough, grab one 1/2″-1″ pieces of front hair from each side. I tied mine in a half knot and then criss crossed the pins in the back. I know they don’t match, but I am cool like that. I have been preaching about coconut oil for a few months when I finally took to time to buy some and experiment with it. So far I have used 2 different kinds, both were great for cooking and beauty products, I just lean more towards the cheaper ones. You can find it by the olive and vegetable oil sections at your favorite retailer. SAMS Club actually has a HUGE container for like $15, which is CHEAP! You can get a large jar at Walmart/Target/HEB for about $10. One tub lasts me about 3 months, so you get a GREAT amount of use out of it. You do not need a lot and I use it for a lot of stuff. ALWAYS REMEMBER: A LITTLE GOES A LONG WAY! Also, if you are not fond of coconut smells, you can buy the Refined Coconut Oil and that is much less coconutty than the unrefined kind. I am not sure if there is a huge difference between them other than the coconut smell. Using Coconut Oils instead of mousse, hair spray, and other styling chemicals! After Shower Body Oil– Lock in the moisture before you dry! Daily Body Balm– Rub into those dry patches, Sparingly! Stretch Mark Cream– Old and New, Give your beauty marks some TLC and you may be surprised! Lip Balm– Love this on my lips! Night Eye Cream– After you use it as a make-up remover, just wipe away the excess and you have instant creamy eyes! I use to buy top brand hair gels, creams, conditioners, sprays, masks, etc. every time I would get my hair cut. Every 2-3 months for spending an extra $50-$100 did not seem bad. I was not going to some Hollywood Salon, but it was a nice salon with natural products. On average, my hair cuts would be about $50 for my medium to long hair. When I decided to spend time as a blonde and wander from my brunette roots, my bill was around $200 every 6-8 weeks:/. When I worked a corporate job, I always “needed” something. Well, this time, I needed to go blonde. Not to toot my horn, but I looked pretty awesome. lol! Blondes definitely get more head turns..it HAS to be the bright color, per my experience. Needless to say, after I lost my job my hair was the first to feel the effects! I had some major repair to do, but first, I needed to dye it dark to hide my roots. Looking back, I should have just let it grow out since the fade into blonde look was a big deal, but whatever! Honestly, I was only blonde for about 6 months, but was desperately missing my brunette hair. I missed “Me”. I got a little bit of an attitude from the blonde I think, HAHA! A year after growing out some new locks, my hair was still fried. I was not spending anything on hair products except different conditioners and shampoos I couponed that month. I finally found coconut oil and fell in love. Some days, I just put it in my hair in the AM and wash it out at night, if I don’t have anywhere to go at least. 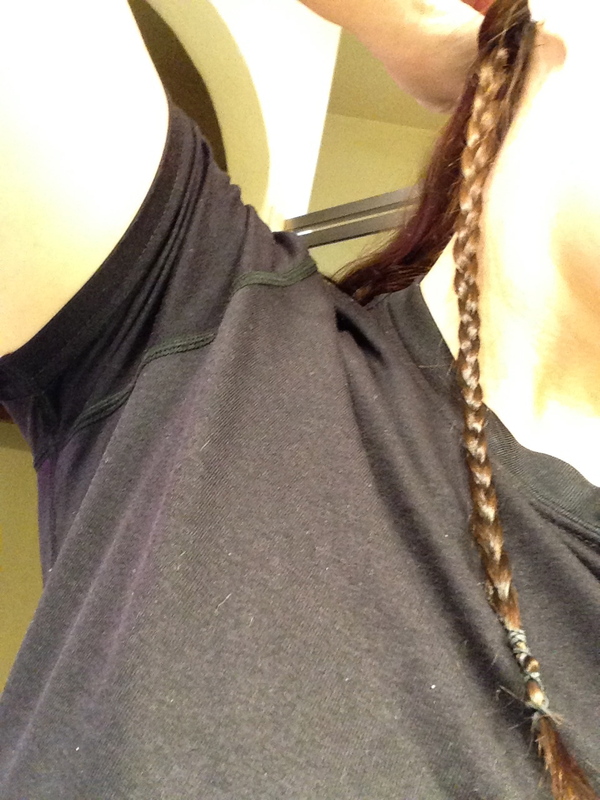 Or, I dip a couple of finger tips in and run it through my hair (away from my scalp b/c my hair looks greasy easy!) before I style it with a straightener, diffuser, or curling iron. It holds well and conditions my hair all day. When my curls starts coming out, I put it in a pony tail for a coconut curly pony tail :). I also use it to tame fly aways! I heard of baby oil and its effects on your body if you put it on right after you shower, before you dry off. So I wanted to test that theory with coconut oil. Again, you do not need a lot. Simply step out of the shower or bath, grab some coconut oil and rub it all over your body! Then pat dry with a towel, or do what I do and Air Dry…at least as long as your kids will allow you to, haha! It works wonderfully and gives a nice coconut smell! I realized I love this way more than applying any lotion or cream straight to my dry skin. Using it as a lotion to help with ashy skin is okay too, just be careful with the amount you put on. You don’t want bugs and grass sticking to your skin through out the day. I also use it as a suntan lotion 🙂 I randomly rub it on my knees, ankles, elbows and feet throughout the day to help with those rough areas too. Using it on your lips is great for locking in moisture too. I ran out of my normal eye make up remover, and instead of grabbing a bar of soap I tried out my oil. Worked Wonderfully! I used toilet paper to wipe up and it even conditioned my eyes (I usually only wear eye make up) for the night. So you may say it helps fight wrinkles too! Don’t forget to use it on those stretch marks ladies and men! From working out, having babies, gaining weight, losing weight, whatever, or even to use as a preventative, Coconut oil helps give the skin the moisture it needs to help your skin repair and stretch the way mother nature intended. I have developed a sort of dry skin irritation one one side of my face by my mouth. I thought it was from allergies, then I realized it was from this strong store type facial cleanser with who knows what chemicals in it. It was so strong it messed my face up for two or three months. It would get itchy and so irritated. I had to wear make up sometimes because I was self conscious about it, but most of the time I did not because I did not want to irritate my skin anymore. I used neosporin and hydrocortisone mixed together to help it, before I found coconut oil. But then I researched and found that steroid creams are the worst thing you could do. Great. So, I stopped. I found tea tree oil, and that cleared it up after a week (that is for another article!) Now I use a combo of Tea Tree Oil and Coconut Oil if I develop an irritation again. Yes, it happened one other time a few months ago..and that is when I realized it was from that facial cleanser! UGH oh the life lessons (shaking fists in the air)! Eat a tablespoon of coconut oil every day or a few times a week to help with your digestion, regularity, cleaning toxins out, and giving your body some major nutrients. It will help suppress appetite too if you are trying to lose weight. Oil Pull with coconut oil for a healthy smile. I have my kids do this for a few minutes when I can, but hey it is better than nothing in my book. Swish oil in your mouth for 5-20 minutes and it will promote healthy gums, good breath, healthy and strong teeth, help heal cavities (yes this is for real, google it), and suppress your appetite. However you orally use it, it will also help your skin by absorbing through your mouth. All in all, coconut oil is great. There are many other uses you can find to use this magic oil for I am sure! I have even had my bearded husband use it as a leave in treatment! Massage oil, acne spot treatment, face moisturizer, etc. the possibilities are endless. Just buy some and try it. Cook with it! I can’t afford to only use coconut oil when I cook, but Olive Oil takes place of that. I have used coconut oil to cook some asparagus and other veggies and always turns out wonderfully! Use your coconut oil as a liquid or solid! The cooler it is, the more solid and “balmy”. The warmer it is the more liquid it is. Most people do not drink enough water in a day, me included! Coconut Oil will help lock in any moisture and keep your skin and body healthy if you drink your recommended amount of water every day! This is all my opinion from using, researching, and experimenting with coconut oil. Check out my other article for making your own DIY Beauty Products from things found in your kitchen! And my other article about why you SHOULD be using more all natural products! Send suggestions in the comment section please!! More Homestead Hair High Fashion! Who says you have to be boring “pony tail mom” everyday? Dress up your ponytail or bun with this cute braided twist to an all too common up-do. This one is much like the Braided Headband, and you can even combine these two and have a pretty cool looking up-do! Here is how you get started! 1. 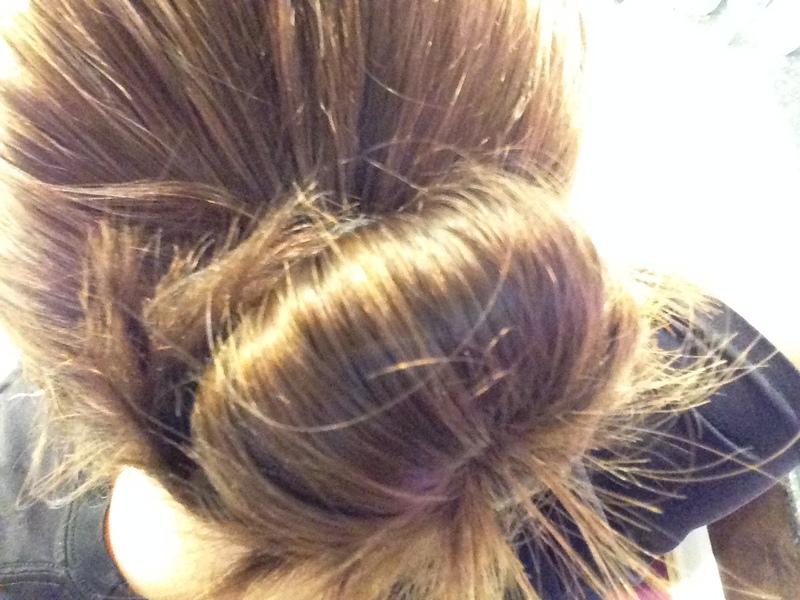 Grab a section of hair (It can be as big as you want really, as long as you can wrap it around the bun. The bigger the more noticeable. I like this size, but sometimes I like bigger sections) and braid it down. Secure with a small elastic. Try to grab the hair that is more directly behind the bottom of your ear close to your neck. 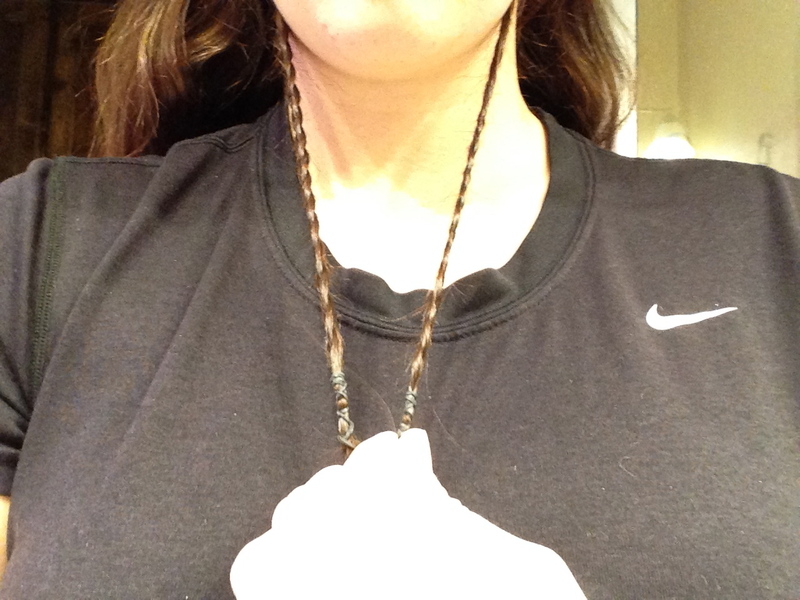 This helps keep the start of the braid discreet. 4. 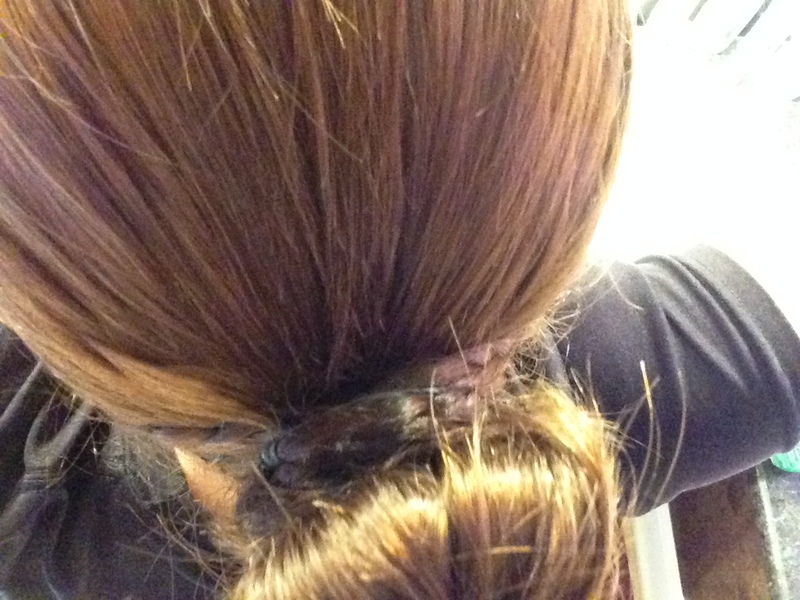 Wrap one braid at a time whichever direction you are comfortable with around the bun. You can secure with bobby pins in the bun or I used a small elastic and just plopped it over the whole thing when I was done. When you wrap the first piece, you can use the second piece to secure the first one by starting off tightly criss crossing it. 5. From the Top! 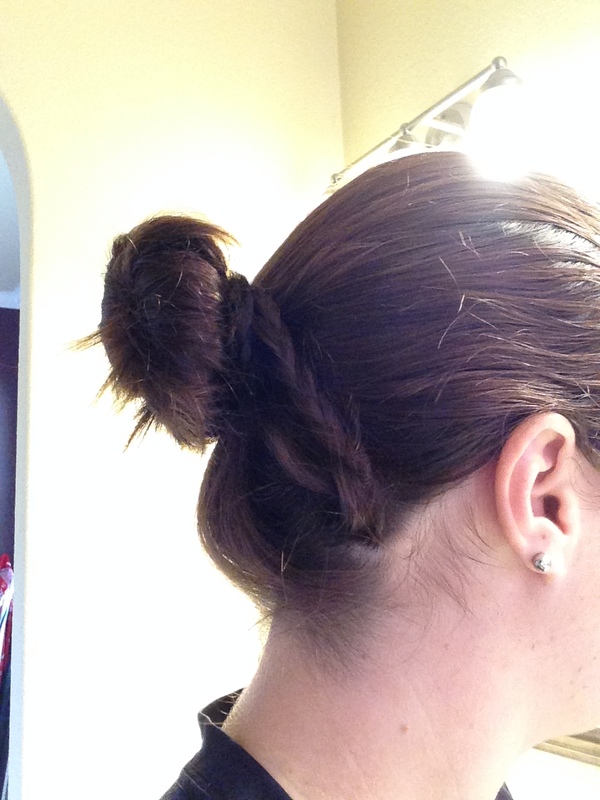 Looks like your bun/ponytail is held together with your own hair. So Pretty!